New year, new kitchen quandaries! Rather than freezing four separate containers of homemade crab stock, I used it to make a healthy Ramen/Pho-like pulled pork and soba noodles dish. We even had leftover pulled pork at the end of it. Pulled Pork: place all ingredients in a crock pot on low for 6 hours. Noodles: once pork is ready, cook noodles of choice separately in their own pot using additional broth. Add kale or other greens once noodles are near al dente. Serve pork on top of noodles and add condiments of choice. David had his with a little Sriracha sauce. Tonight’s dinner was a Thai spin on slow cooked meat and potatoes, minus the caloric unknowns of takeout. Even with my simplified and somewhat clumsy hybrid of Domestic Superhero’s Crock Pot Thai Peanut Pork and Eats Well with Others’ Coconut Potato Curry, the crock pot generated heavenly smells all afternoon, and the potatoes turned out oh so tender. In the crock pot, place a pork tenderloin followed by a jar or so (drained) of roasted red (bell) peppers, 1/2 cup of soy sauce and 1 teaspoon red pepper flakes. Sprinkle 2 minced garlic cloves and 1/2 cup of peanut butter around the liquid. Set the crock pot on low for 6-7 hours. Midway through, turn loins over and distribute peppers over the top to keep meat moist. Towards the end of the cooking time, shred meat in the pot and let it cook in its own juices until ready to serve. Meanwhile, drizzle about 1 tbsp of olive oil in a large pan or Dutch oven over medium to low heat. Sprinkle 1/2 teaspoon cumin, followed by 1/2 cup soaked and chopped cashews, and stir to coat. (Keep heat low so cashews don’t burn.) Add about 1 pound red potatoes and toss to coat. Next, add a mixture of 1/2 cup water and 2 tbsp tomato paste, followed by a can of lite coconut milk, 1/2 teaspoon cayenne pepper and 1/2 bag of frozen peas. Serve shredded pork in a bowl with the potatoes, peas and coconut milk broth. Enjoy the clearing of your sinuses! I desperately needed to find a new meat technique to take me out of my weeknight rut. So when I came across slow cooked Asian-style short ribs on Pinterest, I decided to give it a whirl. But there was a catch: all I had to go off of was a list of ingredients, and a leap of faith. As hoped, the meat fell off the bone about 5 hours in. And the results were deceivingly decadent! Mix all ingredients together in the crock pot, and then arrange 4 pounds’ worth of beef short ribs in the sauce. Cook on low for 6 hours. Flip about half way through cooking, and then again towards the end if you plan to leave it on warm for extra time like I did. I served the ribs over salad that had been mixed with Asian vinaigrette, but rice or noodles would work well too. I’m a convert and just pinned about 20 new recipes for my new weekly staple. Welcome to the family, short ribs! In the early days of Dinner with David, I spent a fair number of nights boiling chicken to make enough shredded, juicy meat for several dinners. Nutritious and satisfying, it was about as exciting as, well, boiled chicken. So, with a generous bunch of green onions in the fridge, and inspiration from Pinterest, I took some liberties with two nights of leftovers. Simply boil leftover broth along with two cups of water. Add 1 tbsp each of soy sauce and fish sauce, and green onions. Add soba noodles and cook until nearly tender; then add leftover chicken and frozen peas, and stir until peas are cooked through. This attempt was a little more dicy. Inspired by Pinterest, I decided to give the ol’ rice cooker a try at making Spanish rice. Add one can of diced tomatoes (I used tomato sauce), 1 1/2 cups water, 1 1/2 cups of rice and 2 tbsp of taco seasoning to the rice cooker. Be prepared to force your rice cooker’s handle to stay in the on position like I did (mine wanted to stop a couple of minutes in). But, unlike me, don’t let it cook so long it chars the bottom of the pot. 🙂 Serve with leftover chicken, broth and green onions. Today I was introduced to a whole new world inside of Duc Loi Supermarket in the Mission. They carry all kinds of local produce, organic products and wine, for a fraction of the price of fancier gourmet shops. But what we really came for was the Banh Mi Sandwich from the deli counter. At just $5 a pop, you get an entire meal in one sandwich – and bite by bite, it lived up to its rep. So what’s in a Banh Mi sandwich? Five kinds of meat: pork pot roast, liverwurst, pork roll, head cheese and pork belly. But here’s the kicker, all that rich protein is balanced with carrots, jicama, cilantro, cucumber, daikon, and jalapeno – served on French bread. Oh, and I walked out with a bunch of green onions for $0.49. Can you think of anything that costs less than a $1 at the grocery store? Me neither. Consider me a convert! Us modern girls like to have our cake and eat it too. Why not squeeze in a workout while making dinner? Lately I’ve been putting this theory to the test, courtesy of our makeshift home gym.Here’s how to make ramen inspired by Everyday Food‘s Asian-Style Chicken Soup, while doing four sets of three exercises. It may sound crazy, but if you’re a multi-tasker like me, you’ll eat it up (pun intended). And if all that juggling makes it hard for you to remember to defrost the chicken ahead of time, no worries – this version uses straight-from-the-freezer tenders. 2. Put 5 frozen chicken tenders in pan; cover with foil. Fill large pot with water. 3. Put chicken in oven and set timer for 20 min. Turn stove on high; put pot of water on. 4. Put Chinese-style ramen noodles in the boiling water for 3 minutes; stir to separate. 5. Check on chicken; set timer for 15 more minutes, if needed. Remove noodles from stove; drain and leave in colander. 6. Put drained noodles in bowl with 1 tbsp of oil to avoid sticking. 7. Remove chicken from oven to cool. To make the soup base, combine 10 cups of chicken broth, 3 tbsp fish sauce, 4 tbsp soy sauce, and a dash of ground ginger in the same large pot you used for noodles; bring to boil. 9. Add noodles, chicken, and any veggies you like (I used spinach and radish slices) to the broth. Bring back to boil. Simmer for a couple of minutes. Season as needed. Enjoy your ramen with a side of endorphins. I’ve been wanting to try a flank steak recipe for some time, so tonight I modified Everyday Food’s Asian Steak Salad with Napa Cabbage. 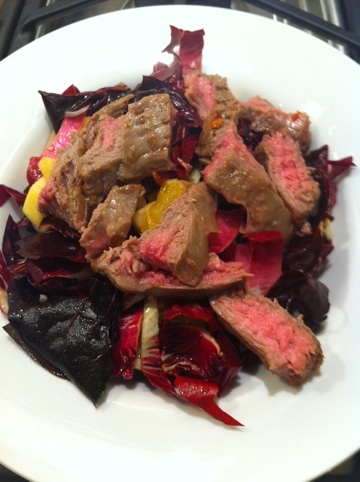 I used radicchio in place of napa cabbage, and half an orange instead of two limes. I also used the same stoneware casserole dish to marinade and cook the steak. 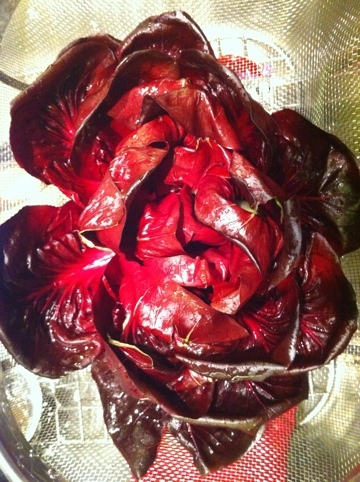 Since the radicchio is more bitter than cabbage, I cut it with a diced fuji apple. Lastly, I diced up the other half of the orange for extra sweetness. Night 1: boiled spaghetti in low sodium chicken broth; added spinach towards the end. Meanwhile, sautéed sliced zucchini in olive oil. Served zucchini over pasta with Parmesan. Night 2: sautéed broccolini and bok Choy (cut into 1-2 inch slices) in olive oil; covered and steamed until slightly tender. Added soy sauce and leftover noodles from night 1 and cooked until warmed through. Voila! Once upon a time I made homemade Pad Thai. I used a similar method the other night to clean out the limited items in my fridge, this time using rice noodles, corn, spinach and egg (cooked in garlic). The sauce consisted of soy sauce and brown sugar – but the original recipe calls for lime. Basically, you saute two chopped cloves of garlic, scramble two eggs in the same pan, and then set aside. Meanwhile soak the noodles as instructed. Saute the spinach and corn in the same pan used for the eggs; remove. Saute the noodles with the sauce, then mix back in all the other ingredients. It’s a light way to enjoy the Thai fan favorite. We ate the entire batch in one sitting!